On Friday, errands and a meeting brought me to Queen Street West, an area of the city that brings up fond memories of art college days. Usually I would rummage through antique shops and read as many crochet and knitting books as I can at Romni Wools, but I wasn’t having a very good day, still recovering from a particularly tough day at work earlier in the week. Self‐doubt came rushing in like a giant wall of waves. And the future suddenly seemed very bleak. Like nothing I do is ever good enough, or ever going to be good enough. 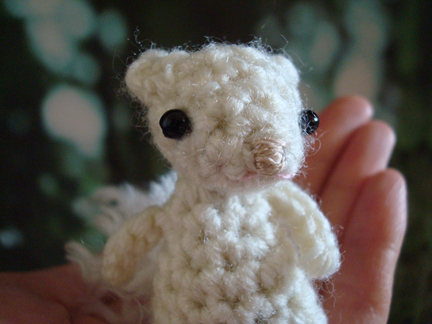 After running those errands I still had plenty of time before the meeting, so I decided that I would try to find the white squirrel at Trinity Bellwoods Park. 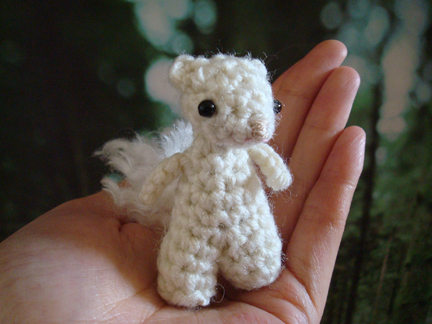 But not only the white squirrel, all the squirrels must be hiding in cool places in the trees — I could hardly see any squirrel at all! I dragged my heavy bags and tired legs forward in an attempt to find a park bench in the shade — avoiding the sunny spots was what needed to be done here — but the only free ones were those baking in the sun, of course. So I walked toward a friendly‐looking tree that offered a large area of shade. 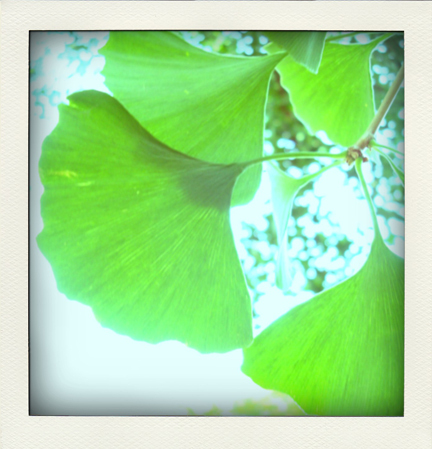 Once I was under its shade I looked up, and realized that it was a ginkgo tree — a living fossil, my favourite kind of tree! That made me happy, like spotting a friend in a party of strangers, or receiving kindness from a passerby. 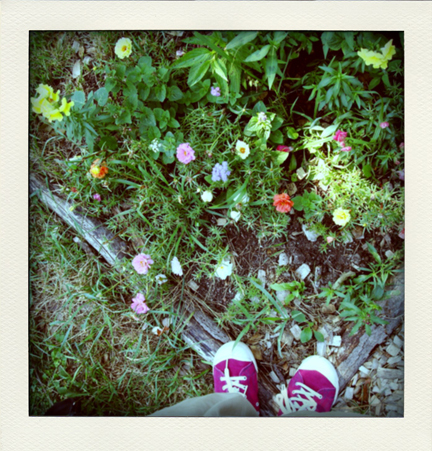 I sat in the shade for a bit, and when I was less tired I got bored, so I walked around the park, and found a small flowerbed, with flowers of all different colours, like a celebration. There were lots of these flowers that looked like they were made out of crepe paper. I don’t know much about plants and dont’ know what they’re called. Perhaps you can help me out? After wandering in the park I still had more time, and I was feeling a bit better, so I thought I’d wander in the streets. 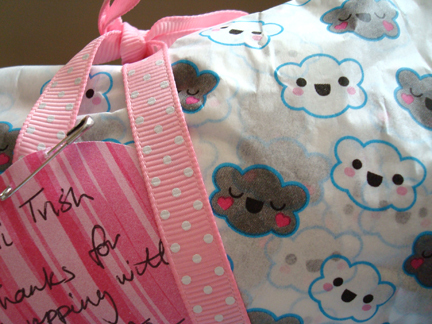 After all, while being all gloomy earlier I skipped some of my favourite shops. 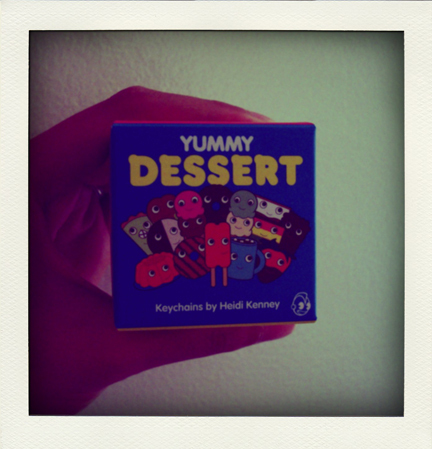 So I wandered into Magic Pony, and was surprised that they carry the Yummy Dessert keychains by Heidi Kenny — I thought they were only sold in the US! 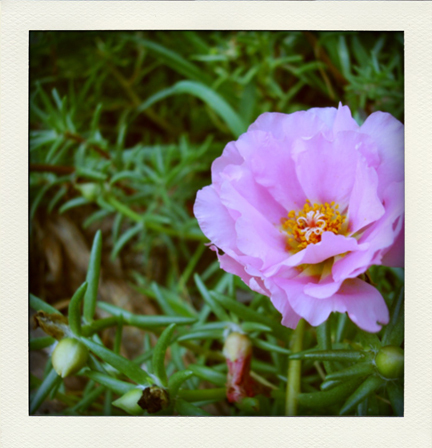 Heidi Kenny’s blog was one of the first ones I followed and inspired this little blog of mine. So I thought I must get one of those keychains! Problem was, they were sold in blind boxes, which meant that one couldn’t choose the particular toy one wanted. You know which one I wanted to get most? My favourite is the jello mold. 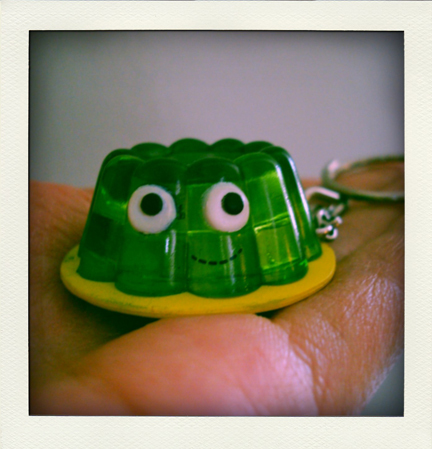 OMG I GOT A JELLO!!! The Magic Pony is indeed magical. When I got home it was late. I checked my emails and WordPress told me that a lovely visitor had commented that she liked my favourite things posts and may consider writing in her blog again. These words of kindness remind me of those moments when a client looks up from the art she’s making and smiles with her eyes, satisfied by a moment of joy or healing or insight or connectedness with a vibrantly creative part of self. It’s about offering what little I have and seeing others turn it into something amazing beyond my imagination. I mean, the ability to turn ordinary things into amazing things is already inside everyone, whether I put things out there or not. But I guess the difference is that I did put things, or sometimes myself, out there. Sometimes it does nothing, but I know that sometimes it can make a difference. And that, I remind myself, is what I will have to hold on to as I travel along. 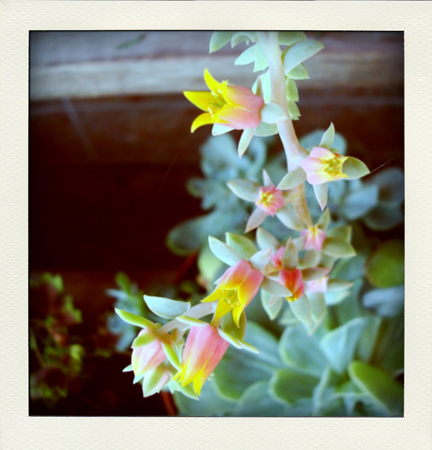 Today we walked passed a food market and saw this blooming succulent plant (again, I have no idea what it’s called). I’ve seen the same kind of plant before, and when it blooms it has a long stem coming out of the middle of the plant with small pink flowers branching out at the top. I always thought it looks like it’s offering its flowers to the world. It’s a bit of a long‐winded post. A bit all over the place, too. But I guess at the end of the day it’s just about catching the bright things, and finding parts of myself and my place in the world in the midst of the bright things and not so bright things. 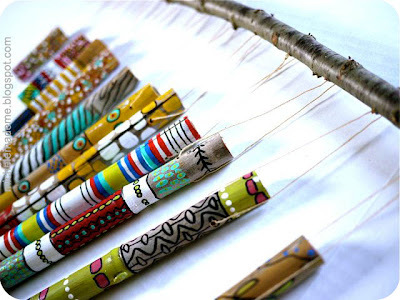 Make a summertime wind chime with bamboo stakes! Tutorial from Michele Made Me. Made with acrylic paint and water in spray bottles! Acrylic paint really does not come off clothing (the splash of purple paint that I got on my tan colour coat hasn’t even faded after 4 years and countless washes) and in this case it’s a good thing :D I’ve got to give this a try with some plain old t‐shirts sometimes! From Frugal Family Fun. I have this duvet cover from Ikea! 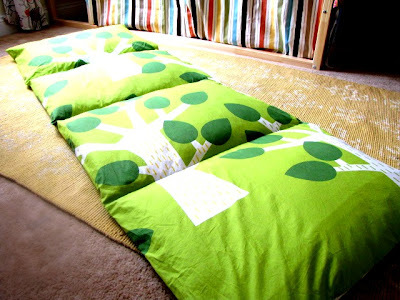 :D This duvet‐cover‐to‐pillow‐mattress makes a wonderful day bed, without having to buy the bed frame and everything. How‐to on Southern Disposition. This reminded me of someone from art college, who one day brought his bicycle into school, laid out several large pieces of paper in the hallway, somehow covered the wheels of his bike with printing ink, and rode his bike across the paper :D Don’t have room in the apartment to ride a bike across the paper, but this rolling pin method seems fun! From Irresistible Ideas. I’ve never worn heels in my life (for real!) 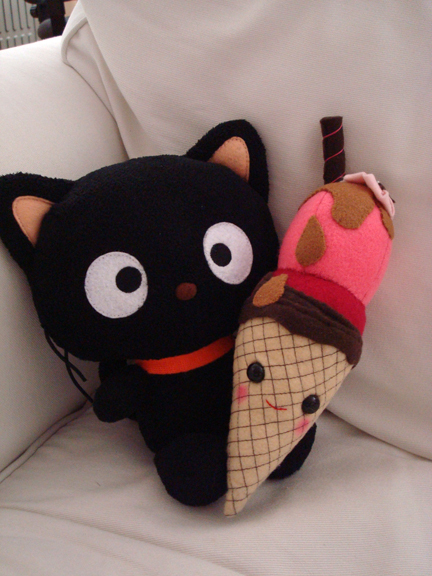 but these are cute. 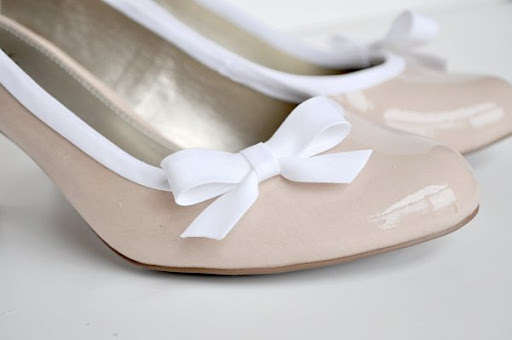 Heels embellished with bias tape! I’m sure it will also work on a plain pair of flats. Genius idea from The Mother Huddle. This is fascinating — printing on crochet and knit items with cyanotype. It’s unlikely that I will try it because of the complicated chemicals involved, but it’s lovely to look at. 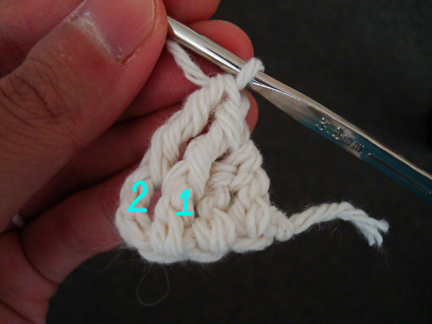 If you’re interested there’s a detailed how‐to on Craft! When I was in high school solid perfume from the Body Shop was particularly popular. I got one from a friend for Christmas. 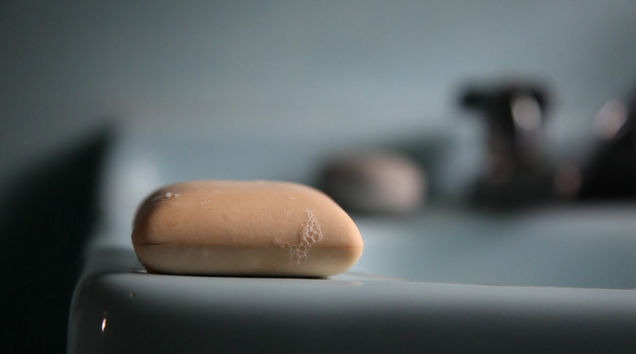 The ingredients in this project looks manageable, with beeswax and essential oils — a Christmas gift project, perhaps! From Design Sponge. This is so simple — just a pencil with an eraser top and ink pads — but the possibilities are endless! From Momtastic. A really neat way to make a paper cut portrait, using photo‐editing software to separate the highlight and shadows of a photo. 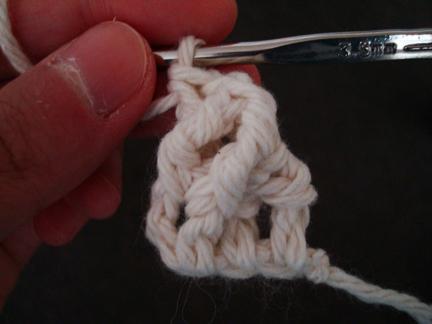 Tutorial on Dude Craft. We’re in need of more working surfaces in our apartment, so this mini lap top desk tutorial from Fresh Home Ideas really caught my eye. We’re not handy kind of people though, so we’re probably going to look for a ready‐made desk rather than build one. It’s a cool‐looking desk nonetheless! These orange boat jello cups are brilliant! 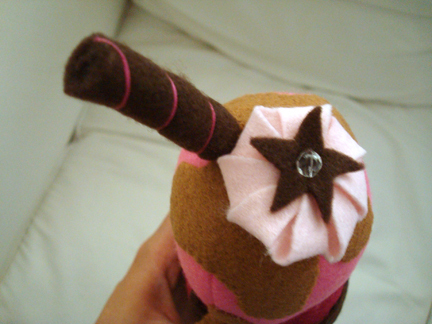 Part of a how‐to for a pirate‐theme party on Make and Takes. And this Rubik Battenburg cake would be a hit at any party. Recipe and how‐to on S’tasty. 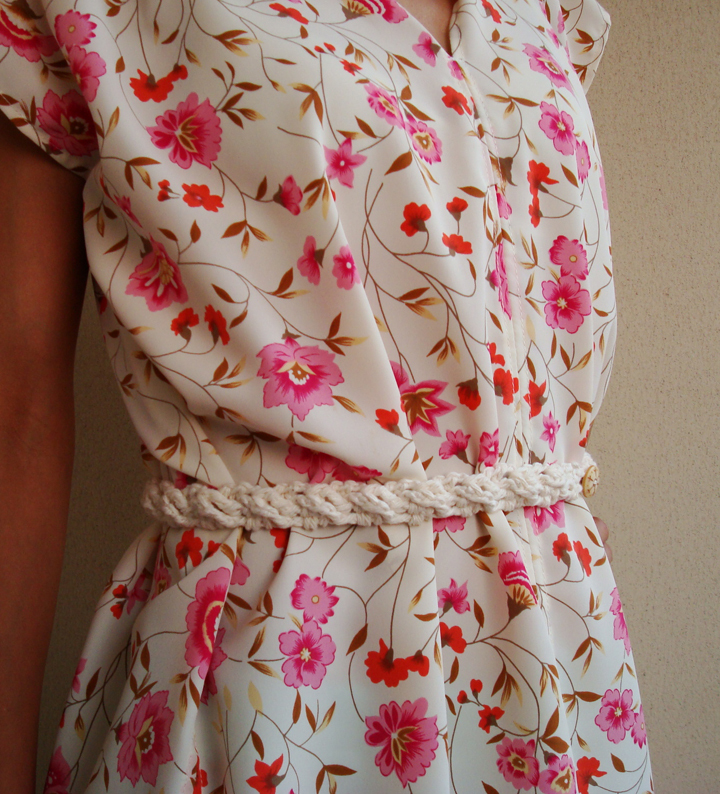 I recently made a dress out of a pillowcase inspired by this tutorial (more on that dress later — I’m going to make one big post of my recent dressmaking adventures :D) and I really wanted a red belt to go with it. 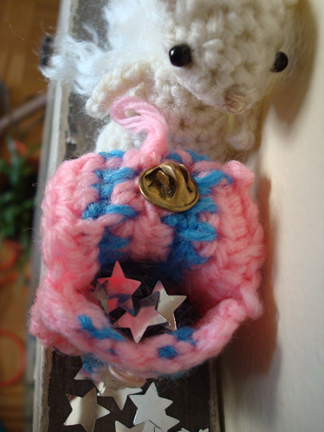 I really like the texture of this star stitch coin purse pattern so I decided to modify it a bit to make a belt. So the pattern isn’t really my original — I owe much to Fruitful Fusion, the blog where I found the free star stitch coin purse pattern, and for which I’m very thankful because I learned a new stitch! :D I think it works really well for a belt because it’s tight and sturdy, so I documented what I did in case others are interested in making a belt too. 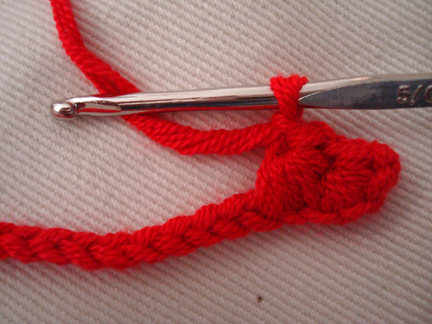 I used some random red yarn in my stash, which was gifted to me along with three other boxes of yarn so there was no label, but it should be a sport weight or light worsted weight. 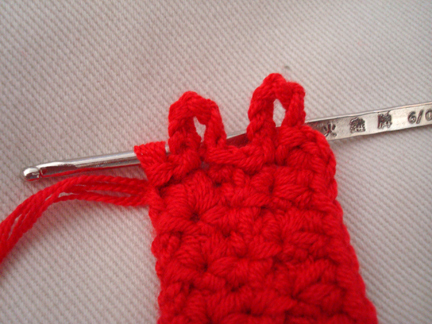 I used a 3.5mm hook to make the stitches tight and sturdy. 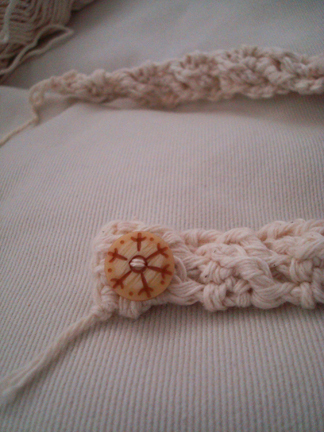 I also used two 1/2″ buttons, plus needle and crochet thread to sew on the buttons. Belt is about 1 1/4″ wide. 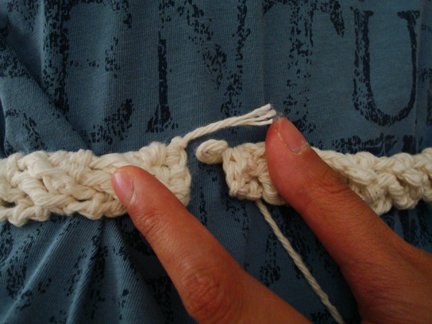 To start, make a long chain such that when wrapped around the waist the two ends meet. 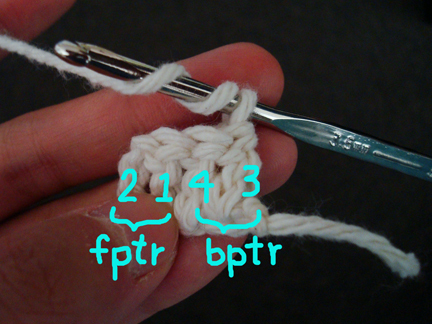 (First stitch con’t) … yo and pull through all 4 loops on hook, ch 1. 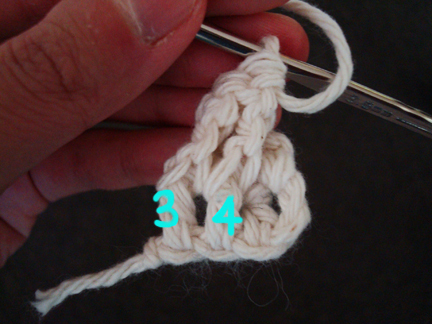 (Second stitch con’t)… yo and pull through all 5 loops on hook, ch 1. 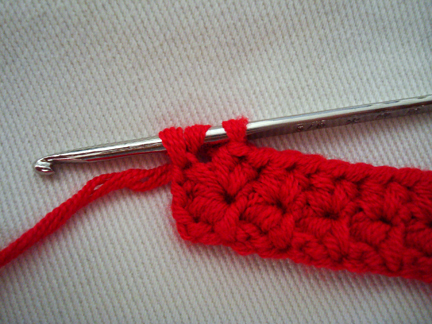 Repeat second stitch to end. 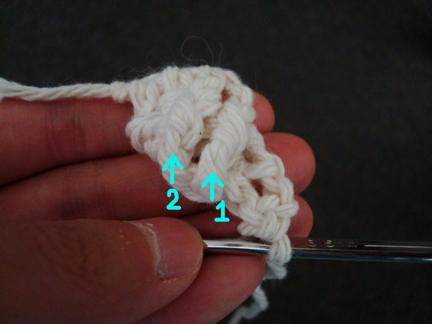 *Note: if you have an odd number of stitches in your base chain altogether, you will have one extra stitch in the end. But I wouldn’t worry about counting the ch to make sure there’s an even number. 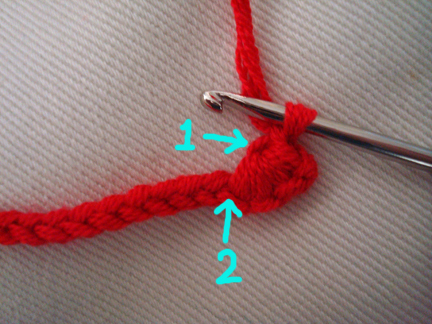 At the last pattern repeat just insert hook into that last ch and pull up a loop, so there will be 6 loops on hook, then pull through all loops and ch 1 as usual. ch 2, turn, 2 hdc under each ch 1 space to end. Note that I work the hdc under the ch 1 space from previous row, rather than into it, to avoid having a ridge between the rows of star stitches. 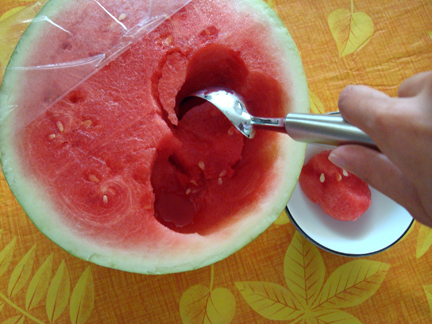 The picture below demonstrates where I’m inserting the hook. 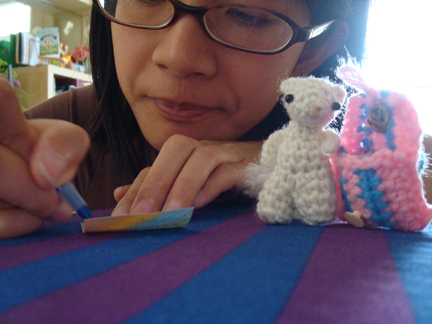 At the end of the row, work 1 hdc into the top of the turning ch of the previous row. 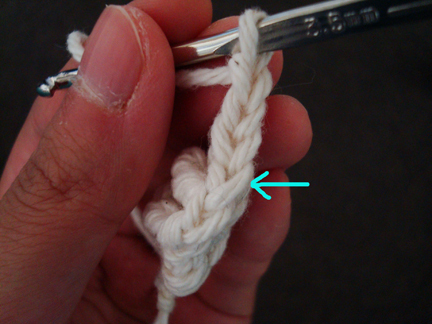 (First stitch con’t)… yo and pull through all 5 loops on hook, ch 1. 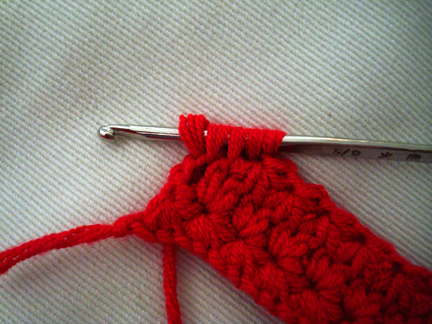 Second stitch and on: insert hook in ch 1 just made, yo and pull up a loop. 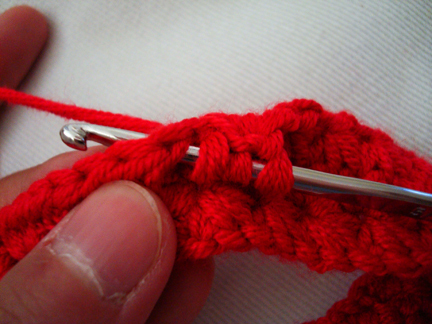 Insert hook in base of last stitch in hdc, yo and pull up a loop. 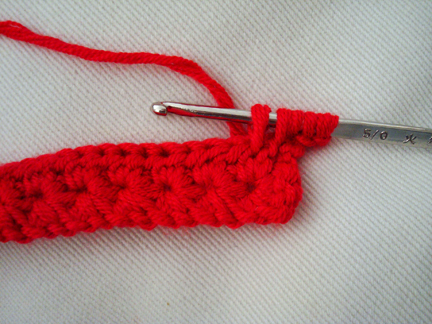 Insert hook in next hdc, yo and pull up a loop. Insert hook in next hdc, yo and pull up a loop. Yo and pull through all 5 loops on hook, ch 1. 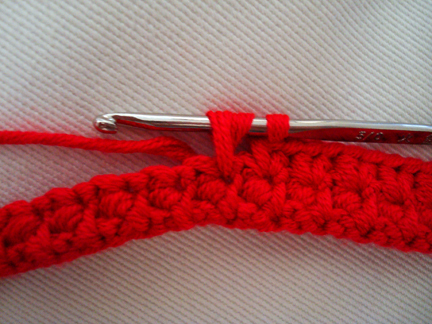 Repeat second stitch to end. 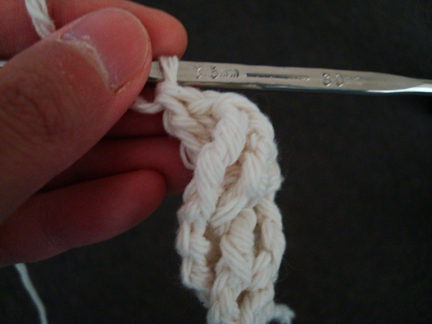 In the last pattern repeat, insert hook in turning ch of previous hdc row, yo and pull up a loop. Yo and pull through all 5 loops, ch 1. Row 4: Repeat row 2. Don’t fasten off. 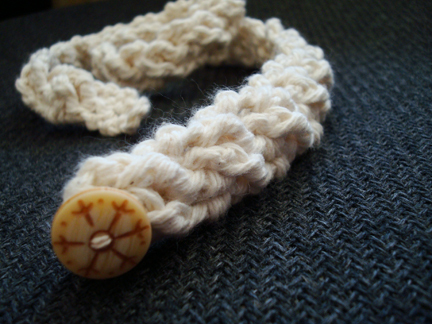 Button loops: worked over the short end of the belt. ch 1, sl st in end of row 4, ch 5, sl st in the same space as previous sl st, sl st in end of row 3, sl st in end of row 2, ch 5, sl st in the same space as previous sl st, ch 1, sl st in end of row 1. Don’t fasten off. Sew buttons onto the other end of the belt (as usual I refer to this method to create more space behind the buttons for the button loops). Before sending him off at the post office, we did a photo shoot in front of my forest backdrop. 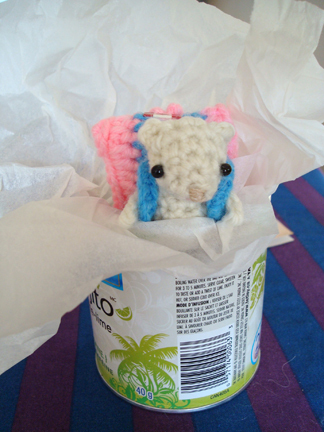 I was going to send him off in a tea tin, but then decided against it, because of a terrible mental image of the tea tin rolling away off the post truck and Al being lost on the road forever… >_< so in the end I used a box wrapped in an envelope. But I think Al riding in a tea tin makes a good photo. I’m so happy that Al has gone too a good home now. 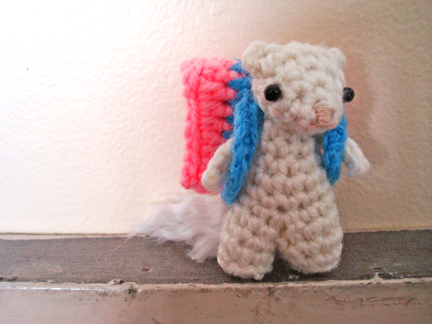 But we’ll still be thinking about you always, Al McFluffytail! 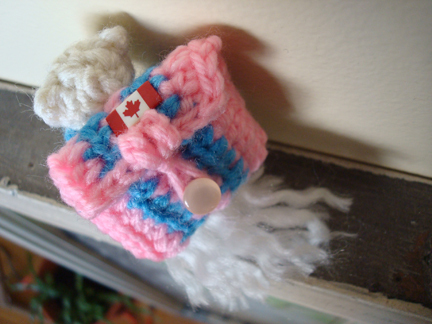 My swap partner even sent a toaster charm with the package! 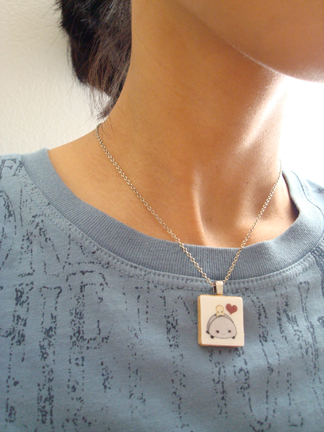 I wear it as a necklace. I feel so spoiled by my swap partner — someone I’ve actually never met in person! 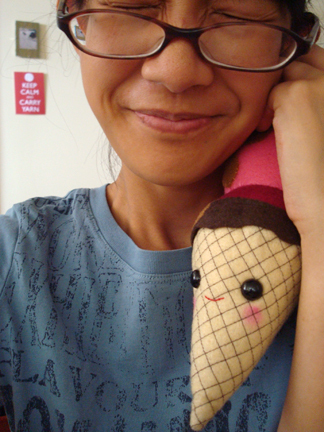 I’m so thankful for her generosity and kindness, and I feel so very special receiving the package — what a gift it is! Thinking about it has put a silly grin on my face for the past few days. 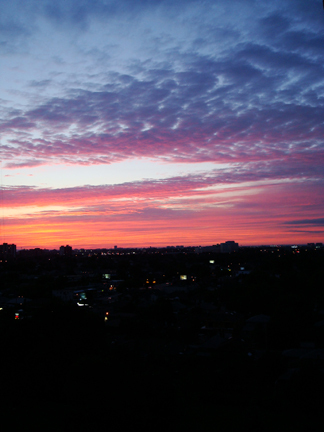 I live in a metropolitan city that is not known for the friendliness or courtesy of its people. So whenever a stranger offers a helping hand or a kind remark or even a smile it totally makes my day. 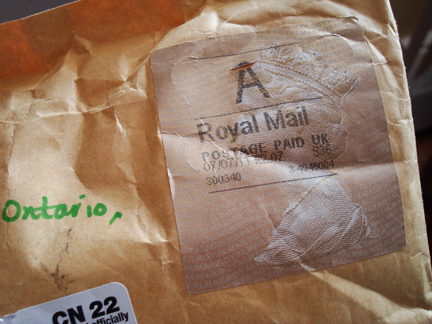 Tomorrow I’m going to show you what I sent overseas for the swap, hopefully. I say hopefully because our internet connection has been spotty. But the cable guy is coming to check things out tomorrow so I’m hoping that it will return to normal shortly! This video reminds me of the beginning sequence of the animated film Up, which always brings a tear to my eye. I love the way it captures the small things, so matter‐of‐fact yet with such tenderness. Like the old chair, the piano keys, the bar of soap, the diary, and a lifetime of stories. Have a happy and re‐energizing Sunday everyone! 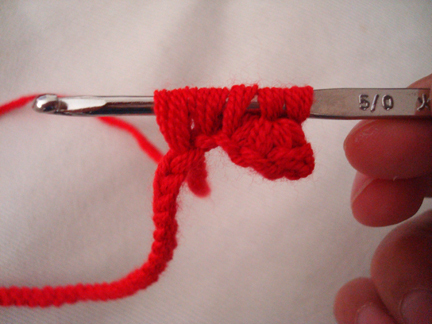 I was never a big fan of making friendship bracelets. I think the patterns are intriguing but they take too long. 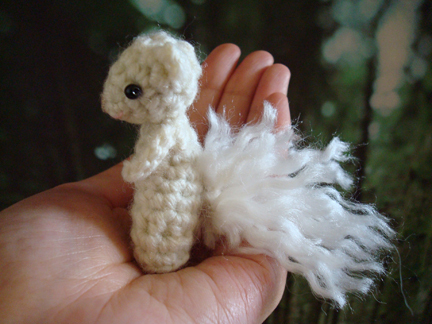 These crochet ones may be a quicker alternative. They’re beaded too, and very stylish. Pattern on Green Eyed Monster. Probably requires a lot of t‐shirts but a circular loom from a hula hoop is a neat idea. (The circular rug is tied off and detached from the hula hoop after the weaving is finished, so the hula hoop can still be a hula hoop! :D) For how‐to, follow the Crafty Crow! I had a miniature hour glass key chain when I was a kid. I would stare at the falling sand and think that it’s the longest minute ever, but when the sand was all piled at the bottom of the glass it really made it tangible to me to understand that that was a minute passed and a minute I would never get back… Perhaps a nice instrument to teach children the value of time, to make your own hour glass see Paris Bourke. I have been wondering if it would be possible to make buttons from shrink plastic, whether the colour would run in the wash. Apparently it works beautifully with the right kind of markers, just look at these lovely buttons on Scissors Paper Work! With a tutorial too! I’ve been trying different methods of paint/watercolour masking, so this sticker resist tutorial from Paint Cut Paste caught my eye. Such a nice way to enjoy the fluidity of watercolour and free‐form colour‐blending while making some nice greeting cards at the same time. Love the simplicity and sharpness of the design. I also like this stamped pattern on the tea towels — an excerpt tutorial from the book 1, 2, 3 Sew on Indie Fixx. 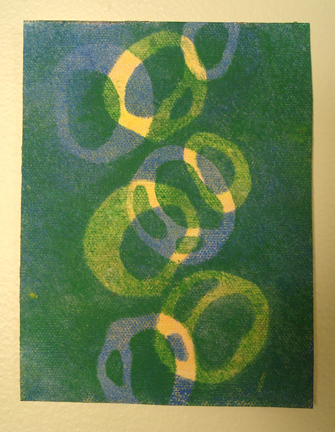 I love how the circles are blending together and I can totally see it on a t‐shirt! 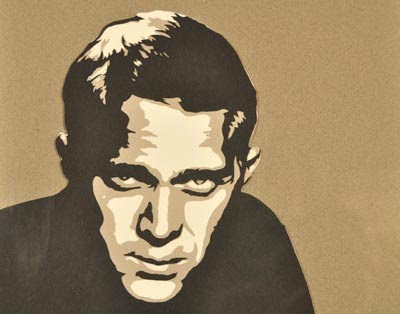 Must get myself some foam stencil brushes. Sometimes I feel bad taking paint swatches from the hardware store, because they have such nice colours and are made of such nice, sturdy paper. I also like to read all the names they give the colours. “This is for taking, for free, for real?” I’d ask myself. Yes, they are. 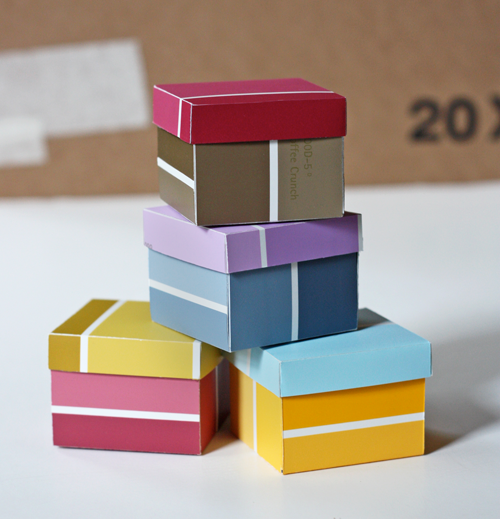 And one could make stylish gift boxes with them! :D How‐to with awesome folding diagram on How About Orange. Paint can planters — they can cheer up any tired old fence! How‐to on Centsational Girl. Make candles with lemon peel! I wonder if they bright out a citrus scent. How‐to on the Martha website (via Apartment Therapy). Also check out the amazing clementine candle tutorial - with the clementine peel and oil, no wax or cotton wick! Instant noodles are one of my favourites. It’s kind of a comfort food for me. 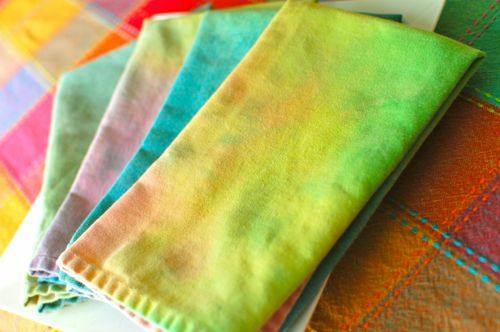 Tonya’s Sewing Room has an awesome step‐by‐step tutorial for turning noodle packaging (or other wrappers) into a zippered coin purse! Will have to give that a try! 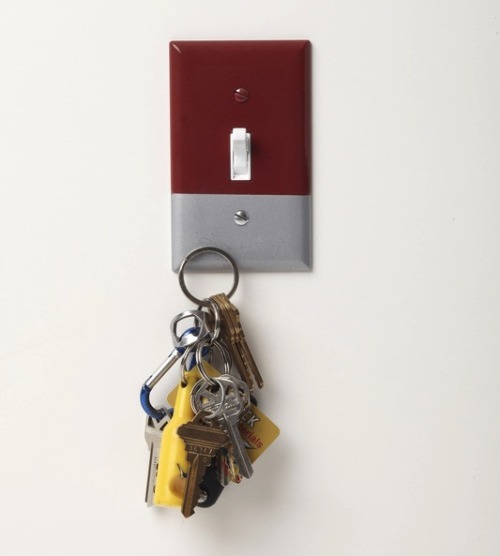 Magnetic light switch cover — what a brilliant idea! I wonder if I could make one with magnetic paint. Via Inspire Me Now. This. Is. Magnificent. From National Geographic: This image was taken in winter time in a arid area of the Canadian Rockies. Temperatures where below -30 degrees Celsius yet because there was no snow fall the surface of the lake was uncovered allowing me to see and capture the bubbles (gas release from lake bed) that were trapped in the frozen waters. It reminds me of this painting by Laura Millard, one of my teachers from college, whose work I love. 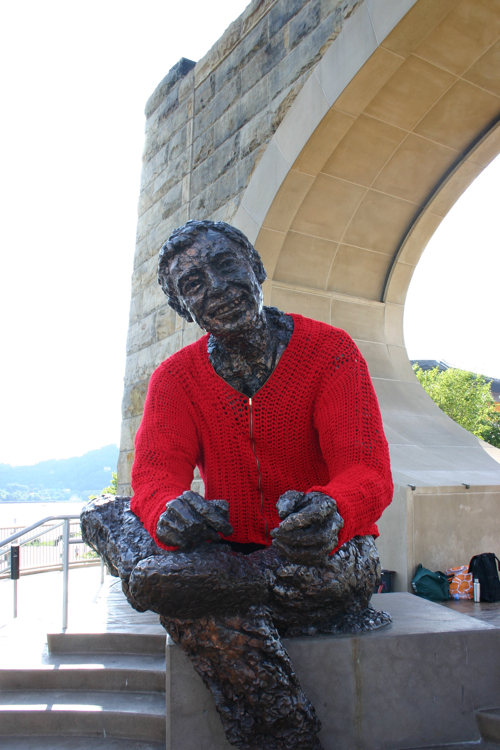 And finally, the most awesome thing I saw this week — Mister Roger’s statue on Pittsburgh’s North Shore gets a crocheted red cardigan! Created by the inspiring Alicia of Create! 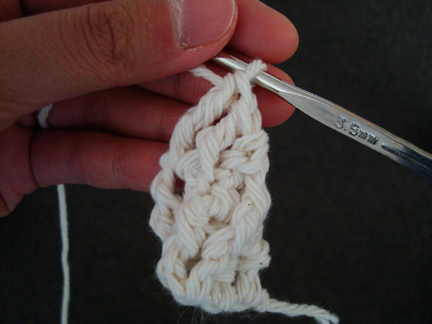 This pattern requires familiarity with basic crochet stitches (ch, sc, dc, tr) as well as some knowledge of cabling with front post crochet and back post crochet (fpdc, bpdc, fptr, bptr). I learned cabling while following this hat pattern (which has written tutorial and photos to explain the cabling action) and it’s actually quite a lot of fun once I get the hang of it. 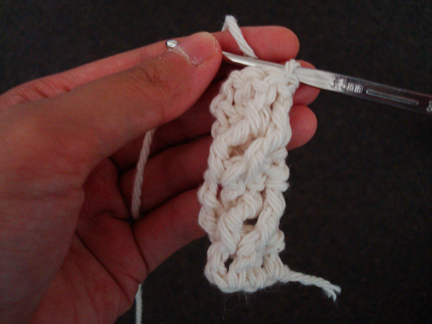 I used a 3.75mm hook and a worsted weight cotton yarn. 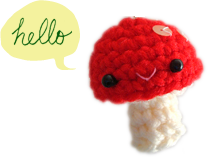 Plus a 5/8″ button for closure (just something I found in my stash, you can use a larger/smaller button if you like), and thread and needle to sew on the button. 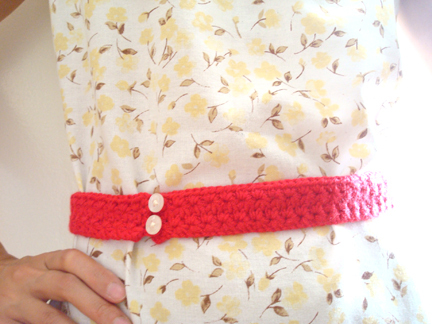 The belt is worked back and forth in short rows cross‐wise until desired length. Row 1: ch 6, dc in 4th ch from hook, 1 dc in each of next 2 dc, turn. (Row 2 con’t) … bptr in first skipped dc, bptr in next skipped dc. Viewed from the wrong side, 2 bptr are made. 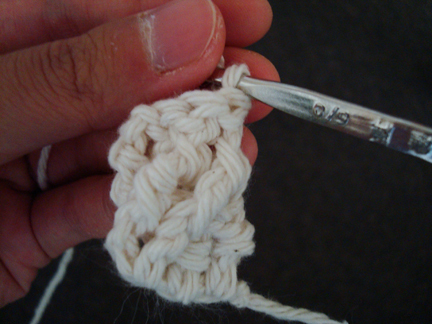 Completed row 2 viewed from the right side — one set of cable made. Turn. 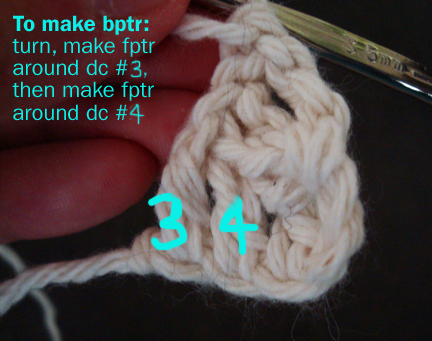 (Row 3 con’t) 1 bpdc in each of the next two fpdc from previous row (the stitches are indicated by the arrows. The picture shows the work upside down because when one is holding the work with the wrong side facing this is what one would see). Turn. Viewed from the right side, row 3 completed. 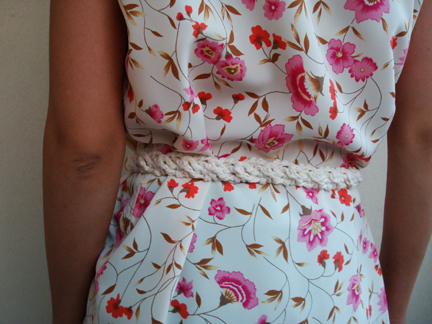 Repeat rows 2 & 3 until the two ends of the belt almost reach each other when wrapped around waist (with an approx. 1/2″ gap). End with row 3. Don’t fasten off. 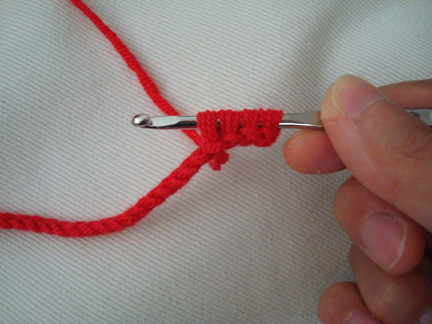 Sew a button to the beginning end (not the end attached to the working yarn). 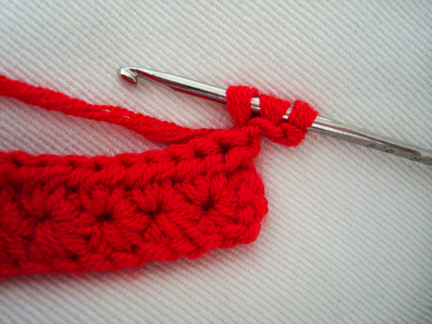 I used a bit of crochet thread to sew on the button for sturdiness, and used this method to create a “shank” so that there will be enough space behind the button for the crocheted button loop. ch 1, skip first dc, sl st in next dc, ch 6 tightly, sl st in same dc, skip next dc, sl st in top of turning ch. Don’t fasten off. Try on belt and adjust the number of ch in the button loop if necessary. 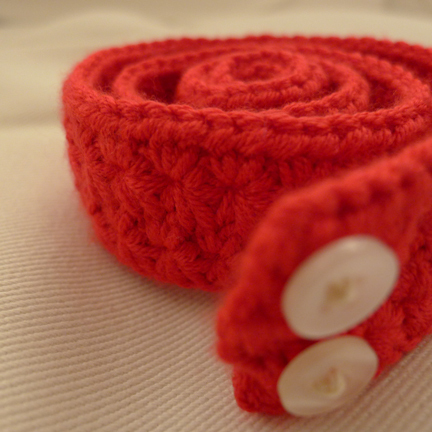 Note: The completed belt will naturally twist a bit so it’s not intended to be worn loosely. It will lie flat if worn fitted to the body. Feel free to drop me a note if you have questions or comments! More painting experiments with masking fluid (to see how masking fluid is used, watch this video), continuing from my last attempt with raw canvas, which worked in the end but proved to be a pretty long and kind of frustrating process. So I tried using the masking fluid on primed canvas. 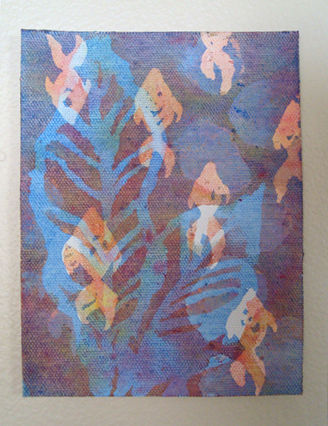 I bought a canvas pad (like a pad of paper, except it’s a pad of 9x12” — it says on the cover — real primed canvas!) and I was quite happy how it turned out :D So happy that I even gave them titles. Masking fluid does its job beautifully on primed canvas, it peels right off. (It feels almost like peeling dried white glue off the fingers, very satisfying.) But then I did some Googling and realized that masking fluid is basically latex particles floating in liquid ammonia :S That explains the pungent smell. 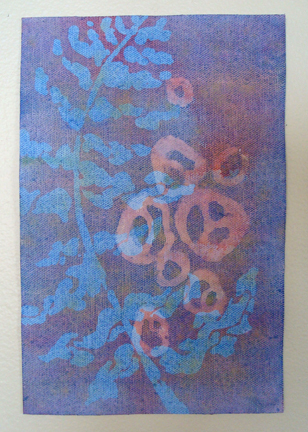 And it wouldn’t be good to use with a group, so I tried looking for an alternative and came across this white glue batik method, which works kind of like masking fluid on fabric. So I also tried masking some of the shapes with white glue. 1. White glue takes a lot longer than masking fluid to dry (masking fluid takes about 15min; white glue, more like several hours). 2. It doesn’t peel off the canvas very easily if the glue is applied too thinly, so trying to shorten drying time by applying a thinner layer of glue doesn’t quite work.